As the opposition momentum increases on the issue of a grand alliance for the 2019 polls, it remains to be seen whether or not it will be successful in posing a stiff challenge to the BJP. Akhilesh Yadav, stoked by recent bypoll successes after joining hands with Mayawati’s party, has made it clear that he wants to continue the alliance with his party’s long-time rival for the 2019 polls. BJP leaders say that since the opposition is not coming together on any particular mudda or issue, the alliance will fail even before the elections. APN’s popular debate Mudda took up the issue. 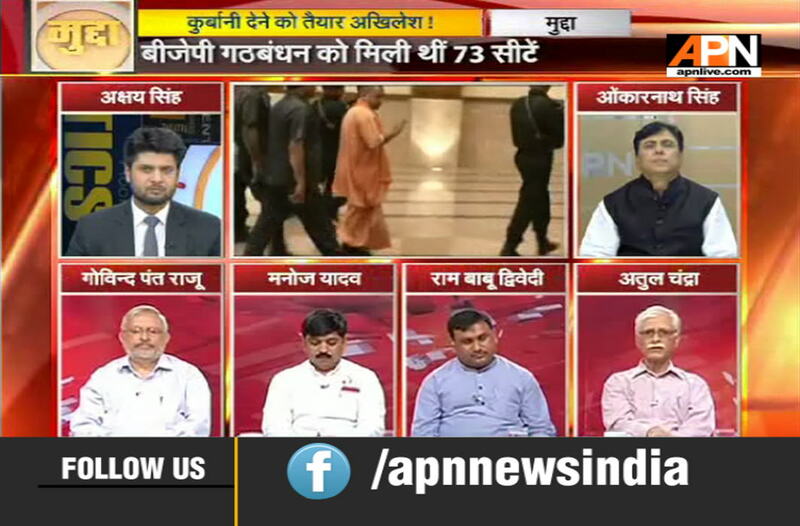 Anchorperson Anant Tyagi posed the questions to panellists including BJP’s Ram Babu Dwivedi, Congress’s Omkar Nath, SP’s Manoj Yadav, political expert Atul Chandra, and APN consultant Govind Pant Raju. Raju added that Akhilesh had indeed damaged the bungalow before vacating, because there were pictures in the media that made it all clear. “This is a big blot on Akhilesh’s image and character,” he added.